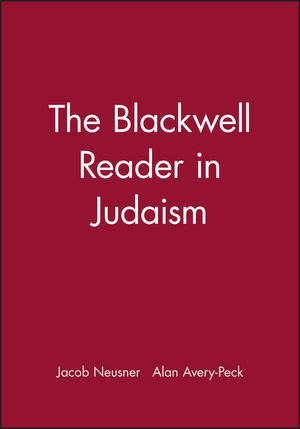 The Blackwell Reader in Judaism introduces Judaism in its own words, affording readers a direct encounter with this ancient and enduring faith. Jacob Neusner is Research Professor of Religion and Theology at Bard College. He has nine honorary degrees, fourteen academic medals and has published more than 800 books. Alan J. Avery-Peck is Kraft-Hiatt Professor in Judaic Studies at The College of the Holy Cross. His has published widely and is editor of the journal The Annual of Rabbinic Judaism: Ancient, Medieval and Modern. Part I: The History of Judaism:. 1. Defining Judaism: Jacob Neusner. "Judaism: The Religion, Philosophy, and Way of Life of the Jews": Louis Jacobs. "Old Habits Die Hard: Judaism in the Encyclopaedia of Religion": William Scott Green. 2. The Religious World of Ancient Israel to 586: Marvin A. Sweeney. 3. Judaism and the Hebrew Scriptures: Philip R. Davies. The Habakkuk Pesher from Qumran (1QpHab), cols. 7-9. Philo, On the Migration of Abraham 1-5 (1-25). Targum Pseudo-Jonathan on Genesis 4. 4. Second Temple Judaism: Frederick J. Murphy. 5. The Formation of Rabbinic Judaism, 70-640 C.E:Günter Stemberger. B. Git. 56a-b: Yohanan ben Zakkai's Escape from Jerusalem. M. Abot 1:1-18: The Chain of Tradition. Y. Peah 2:6, 17a: Written and Oral Torah. Y. Sanhedrin 1:2, 19a: The Ordination of Rabbis. Y. Yebamot 12:6, 13a: Rabbis in the Service of the Community. Leviticus Rabbah 13:5: The Four Kingdoms. B. Baba Qamma 83b-84b: Biblical Foundation of the Mishnah. 6. The Canon of Rabbinic Judaism: The Mishnah and the Midrash: Jacob Neusner. Martin Jaffee, How the Mishnah Makes a Theological Statement: Mishnah Ma'aserot Chapter One. The Midrash: Genesis Rabbah: The Rules of History Set Forth by Revelation. 7. Judaism and Christianity in the Formative Age: Bruce Chilton. Justin, The First Apology 1-3. Clement of Alexandria, Paidagogos, 6.32.- 6.35. Origen, On First Principles 2.11.2-4. Eusebius: History of the Church 8.8.1 - 8.9.6. Augustine, The City of God 22.14-22.15. 8. Judaism in the Muslim world: Sara Reguer. A Late Twelfth Century Curriculum of Advanced Study: Joseph b. Judah ibn 'Aqnin, Tibb al-Nufus. Maimonides' Philosophy: Introduction to The Guide to the Perplexed. 9. Judaism in Christendom: David R. Carr. Solomon ben Isaac on Forced Conversion. Judah ha-Levi: Poem on Return to Zion. Moses ibn Ezra: Poem on Worldliness. Moses ben Nahman: The Disputation at Barcelona. Solomon bar Simson on the Mainz Martyrs. Abraham ibn Daud of Toledo on Samuel ha-Nagid. Maimonides regarding a Hebrew Translation of Guide of the Perplexed. Judah ibn Tibbon on Education. Joseph ibn Caspi on Education and Philosophy (1332). Solomon bar Isaac's Exegesis of Torah (1105). Testament of Eleazar of Mayence on piety and charity (c. 1357). Maimonides on Art and Idolatry. Solomon ibn Adret on faith and reason (second half of 13th century). Solomon ben Adret's ban on study of philosophy by youths (1305). The Book of Splendor (The Zohar) (1286). 10. Philosophy in Judaism: Two Stances: S. Daniel Breslauer. Flavius Josephus: Philosophy is Judaism; Judaism is Philosophy. Julius Guttmann: Philosophy is Alien to Judaism. Isaac Husik: Jewish Philosophy in the Past but not the Present. Philo of Alexandria: Jewish Scripture as Philosophy. Judah Halevi: The Special Function of the Jews. Maimonides: The Philosophical Function of Judaism. Baruch Spinoza: A Modern Critique of Judaism. Hermann Cohen: Modern Religion out of the Sources of Judaism. Emmanuel Levinas: Translating Judaism into Modern Philosophy. 11. Jewish Piety: Tzvee Zahavy. Rules for a Bar Mitzvah. Laws for Visiting the Sick. Laws of Purification (Taharah) and Shrouds. Order of the Wedding Ceremony. Part II: The Principal Doctrines of Judaism:. 12. The Doctrine of Torah: Jacob Neusner. 13. The Doctrine of God: Alan J. Avery-Peck. George Foot Moore, "God and the World". 14. The Doctrine of Israel: Jacob Neusner. Israel as Sui Generis in the Mishnah. Genesis Rabbah: The Metaphor of the Family, "Israel". Israel as Sui Generis in the Yerushalmi's Theory of Salvation. 15. The Doctrine of Hebrew Language Usage: David H. Aaron. The Mishnah and Tosefta: Translations are Appropriate. The Talmud: The Language of Liturgy. The Talmud: Torah Language and Colloquial Speech. The Midrashic Literature: The Preference for Hebrew. Mysticism: The Power of Individual Letters. Part III: Modern and Contemporary Judaisms:. 16. Reform Judaism: Dana Evan Kaplan. Eugene B. Borowitz, "A Liberal Jewish Approach to Ritual". Eric Yoffie, "Moses, Too, Was Once a Marginal Jew". Henry Cohen, "Rabbinic Officiation and Mixed Marriage Revisited". A Statement of Principles for Reform Judaism. 17. Orthodox Judaism: Benjamin Brown. Rabbi Moshe Sofer (The Hattam Sofer): A Testament. Rabbi Samson Raphael Hirsch, "Emancipation". Rabbi Avraham Isaac ha-Cohen Kook on the Unity of Contradiction. Rabbi A. Y. Kook on Ideological Diversity and Unity. Rabbi A. Y. Kook on Secular Zionist Idealism. Rabbi Avraham Yesha'ayahu Karelitz on Israel as a New Torah Center. Rabbi Avraham Yesha'ayahu Karelitz on Extremism. Rabbi Yoel Teitlbaum of Satmar on the Holocaust as Divine Punishment. Rabbi Joseph Baer Soloveitchik on the Objectivity of Halakha. Rabbi Menahem Mendl Schneerssohn of Lubavitch. Yesha'ayahu Leibowitz on Science and Jewish Religion. 18. Conservative Judaism: The Struggle Between Ideology and Popularity: Daniel Gordis. Emet Ve-Emunah-A Statement of Principles. A Responsum on Sabbath Observance. Joel Roth: Faculty Paper Urging the Ordination of Women. Elliot Dorff: Position Paper on Homosexuality and Sexual Ethics. 19. New Age Judaism: Jeffrey K. Salkin. Neil Gillman, "On the New Jewish Spirituality". Arthur Green, "Judaism for the Post-Modern Era". Jeffrey K. Salkin, "What is Spirituality, Anyway?". Jack Moline, "Is Jewish Renewal Good for the Jews?". Part IV: Special Topics in Understanding Judaism:. 20. Ethics of Judaism: Elliot N. Dorff. Jewish Ethics: Aaron L. Mackler, "Cases and Principles in Jewish Bioethics: Toward a Holistic Model". Jewish Morality: Seymour Siegel, "A Jewish View of Economic Justice". 21. Women in Contemporary Judaism: Judith R. Baskin. Tamar Frankiel: The Voice of Sarah: Feminine Spirituality and Traditional Judaism. Marcia Falk, "Introduction of New Blessings". Merle Feld, "Healing After a Miscarriage" and "We All Stood Together". Ellen M. Umansky, "Re-Visioning Sarah: A Midrash on Genesis 22". Judith Plaskow, Standing Again at Sinai: Judaism from a Feminist Perspective. Rachel Adler, Engendering Judaism: An Inclusive Theology and Ethics. 22. Judaism as a Theopolitical Phenomenon: Daniel J. Elazar. Certificate of Incorporation and Bylaws: Congregation Kehillat Jeshurun, New York (1972). Constitution and Bylaws of Monmouth Reform Temple, Monmouth, New Jersey (1988). The Covenant of Petah Tikva (1878). The Scroll of Independence of the State of Israel (1948). 23. Theology in Contemporary Judaism: Neil Gillman. Eugene Borowitz, Renewing the Covenant: A Theology for the Postmodern Jew. Emil Fackenheim, Quest for Past and Future. Arthur Green, Seek My Face, Speak My Name. David Hartman, A Living Covenant. Will Herberg, Judaism and Modern Man-God. Will Herberg, Judaism and Modern Man-Faith. Abraham Joshua Heschel, God in Search of Man. Mordecai Kaplan, Questions Jews Ask: Reconstructionist Answers. Franz Rosenzweig, "The Builders: Concerning the Law". Richard Rubenstein, in The Condition of Jewish Belief. Harold M. Schulweis, Evil and the Morality of God. Michael Wyschogrod, The Body of Faith: God in the People Israel. 24. Secular Forms of Jewishness: Paul Mendes-Flohr. Michah Joseph Berdichevski, "Wrecking and Building". Ben Halpern, "Apologia Contra Rabbines". Yaakov Malkin, "The Faith of Secular Jews". 25. Judaism and Zionism: Yosef Gorny. David Vital, "The Future of the Jews: A People at the Crossroads?". Ben Halpern, "Exile-Abstract Condition and Concrete Community". Nathan Rotenstreich, "The Present-Day Relationship". Shlomo Avineri, "Israel-A Normative Value of Jewish Existence". Ismar Schorsch, "Making Israel a Light unto the Nations: Conservative Zionism Reconsidered". Eugene B. Borowitz, "What Is Reform Religious Zionism?". Isadore Twersky, "Survival, Normalcy, Modernity". Henry L. Feingold, "Zionism: A New Course Needed". Eliezer Schweid, "The Major Goal of Zionism Today: To Build the Spiritual Center". Yosef Gorny, "The Need for a New Hibbat Zion". 26. The "Return" to Traditional Judaism at the End of the Twentieth Century: Cross Cultural Comparisons: M. Herbert Danzger. "I am excited at the prospect of the publication of these books, in that they promise to display the lifelong fruits of research and mature insights of a master scholar on Judaism." Robert Goldenberg. Presents statements about Judaic life today, as well as foundational texts. Affords readers direct access to the vitality and power of this living religion. Provides an apt way of learning about Judaism, since it is a religion that speaks through the 'word'.